Biography Bung Tomo Blog People and People to know where the famous hero of the Indonesian nation. to increase our knowledge of science is also motivated to take the Positive side of the world leaders in the know with Sutomo or call Bung Tomo is listed as a national hero since 2 November 2008 through confinement by Information and Communications Minister M Nuh. He was a character on the events of the battle popoler November 10 in Surabaya. He was an orator, burning spirit to fight to the death, maintaining dignity, homeland and nation was proclaimed on August 17, 1945. For a closer look at Bung Tomo brings his passion for motivation We're so much better here's a little story of life can bung tomo please login or take a look at the positive side that we are also motivated. Sutomo (Surabaya, October 3, 1920 - Makkah, October 7, 1981) or Bung Tomo is a hero known for his role in encouraging the people to resist the return of the Dutch through NICA troops and ending with the events of 10 November 1945 battle hitherto celebrated as Heroes' Day .Sutomo worked as a civil servant, he was a staff person at a private company, as an assistant in the office of government tax and employee small Dutch import-export company.He has also worked as a policeman in the city of Praja and had also become members of the SI, before he moved to Surabaya and become a distributor for the company's sewing machine "Singer". Sutomo grew up in a middle-class family. Education was important to be obtained Sutomo and family. Sutomo tenacious personality, hard worker, his fighting power is very high. At the young age Sutomo active in scouting organization or KBI. He is also joined by a number of political and social groups. In 1944 he was member of the New People's Movement. Around the 1950's Bung Tomo was active in political life. 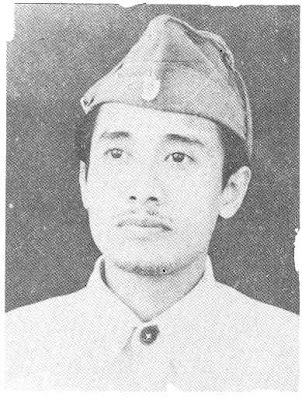 He had become the country Affairs Minister Former Combatants Forces / Veterans as well as Minister of Social Affairs Ad Interim in 1955-1956 on Harahap Burhanuddin cabinet. Bung Tomo is also a member of the House of People's Party of Indonesia 1956-1959. During the New Order government, Bung Tomo criticizing Suharto's policies which he considered starting off. 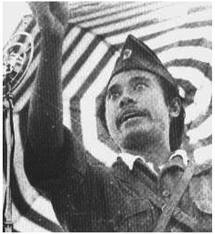 As a result, on 11 April 1978 he was arrested and jailed by the Suharto government. In fact so great merit in the struggle for independence. One year after the resistance freed Bung Tomo later and not much active in political life. Bung Tomo is known as a devout Muslim worship. Beliaupun died while performing hajj in Mecca Arafah desert 1981.Jenazah October 7 Bung Tomo brought back to his homeland and buried not in the Heroes Cemetery, but at the General Cemetery Ngagel place in Surabaya.